When it's snowing and blowing in Cleveland, you won't find many photographers willing to battle the elements. So where do you go to get your daily dose of photography? The main branch of the Cleveland Public Library offers a wealth of choices inside as well as out. 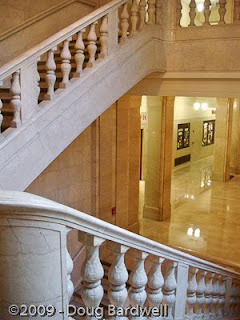 The Cleveland Public Library was originally built in 1925 and retains its marble floors, massive marble staircases, and gracefully shaped balusters. While most patrons take the elevators, the stairways are left to those who choose to stop and appreciate their beauty. Walking the four floors (plus basement) of the original library building, you will find dozens of potential architectural photo subjects, all fixed in place, just awaiting the snap of your shutter. Take the tunnel in the basement and walk over to the second building, redone in 1999, for a visually stunning counterpoint to the marbled original building. Modern from top to basement, the Louis Stokes Wing offers another entirely different set of architectural elements to consider. Before you go, after you've shot all you care to, be sure to take a peek into the collection of 1.3 million photographs archived here in the library. Their collection spans from the 1850's through the 1980's. Included are photos taken during the Great Lakes Exposition (1936-1937) and photos by the renowned photographer Margaret Bourke-White. Then again, since this is a library, you might expect them to have a good selection of photography books....and you'd be 100% correct. Searching their catalog, it lists 7,764 titles. That ought to be enough to keep you reading until the blue skies return. Monday through Saturdays 9:00 a.m. until 6:00 p.m.
Closed Sundays. Also closed holidays including this President's Day - February 15th.